I was hoping to use this page for cycling book reviews because I just have so many and I occasionally get asked for recommendations for gifts or cycling groups. Confession – I have been hopeless! I managed to list a few and to review just a couple. I leave the page here as an index and a place to keep up with any reviews I do manage but at present I confess it is not so dynamic. Any requests can be added to the comments. Post: “A new cycling bookshelf” with short reviews of Rob Penn’s “Its all about the bike”, “Bicycle diaries” by David Byrne and some classic old cycling books. Lovely book about travelling in Syria – read post for full details. This one was a Christmas present from my father – “bit devoid of imagination this year” he said. Ok so its a cyclist and he works for the old man’s favourite paper the Guardian. Not the hardest choice. I didn’t really want to like this, it was all a bit forced at the start. Mid life crisis, cliches about running away. However it grew on me, because Mike Carter is an engaging writer. And ultimately he passed the Bill Bryson test, which is very rare for a cycling writer, only Tim Moore’s “French Revolutions” has really come close in the past. The Bill Bryson test is when something you read makes you laugh out embarrasingly loudly in a public place because you just can’t help it. The journalist in Mike is what makes this book work. He clearly has the knack for getting people to talk and he writes with affection about the many characters he meets on the ride. I can fall in love with the scenery and cycling all over again from his descriptions, but the people bring the book to life. Oh – and he sings when he is cycling. Obviously my kind of cycle tourist. I like Tim Hilton – both as a writer and a really nice guy. he has always been great company on the few occasions we have bumped into each other in London or Suffolk. Professionally he is an arts writer, but he’s a real old school club cyclist. “One more kilometre and we’re in the showers” can really be read as a documentary. If you are someone who grew up in the vibrant club cycle racing scene of the 1950s then you will love this kindred spirit. This is your life, perhaps enhanced with a little bohemian spirit and lots of high quality artistic and historical references as might be expected from an art critic for the Guardian and the Independent. If you are that bit younger then this documentary is about them, the old guys. Every club has them, not to mention CTC groups.Just what is it that shaped their view of our world and develop the secret language of Coppi and Bartali even though they didn’t have Eurosport? Reading about the development of Tim’s hero worship is a window into that post war world and how the glamour of continental cycle racing brought colour and excitement.In fact it is almost a book in its own right. This is the book that makes “proper” cyclists laugh out loud. When it was published in 2002 it went almost viral with sniggering cyclists swapping comments about how stupid he was. When this novice tries to emulate the Tour de France riders he gets everything “wrong”, even including a disastrous attempt at doping. Of course I loved it, but I have a sneaking feeling that it isn’t as funny to those who don’t have that underlying feeling of just how crazy this guy was. But equally we cannot help but carry a sneaky, sneaky feeling of jealousy – wouldn’t it be great to be this this naive – to boldly go where no man has gone before. or at least no amateur cyclist. 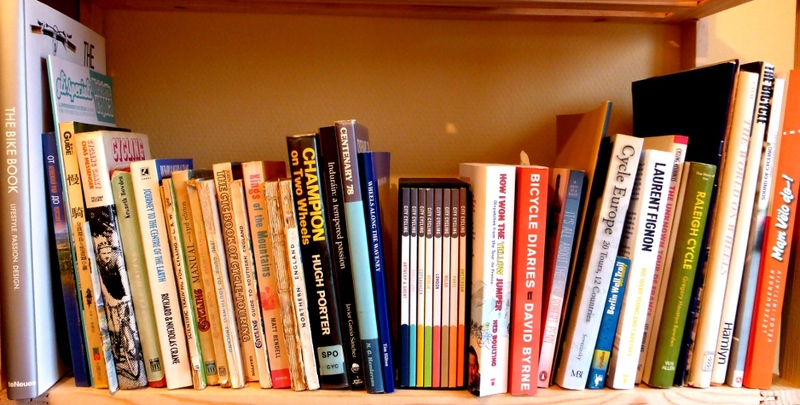 Other cycling books I own: (Not a complete list, see picture above!). You know Kevin, I had forgotten I have Tim Hilton’s on my shelf….waiting for you to remind me to read it! Thanks. Any suggestions as to what I should do with Lance Armstrong’s books most welcome. Pulp them? I don’t have any strangely, but I have numerous Tour de France books that feature him. I’m at a loss too.